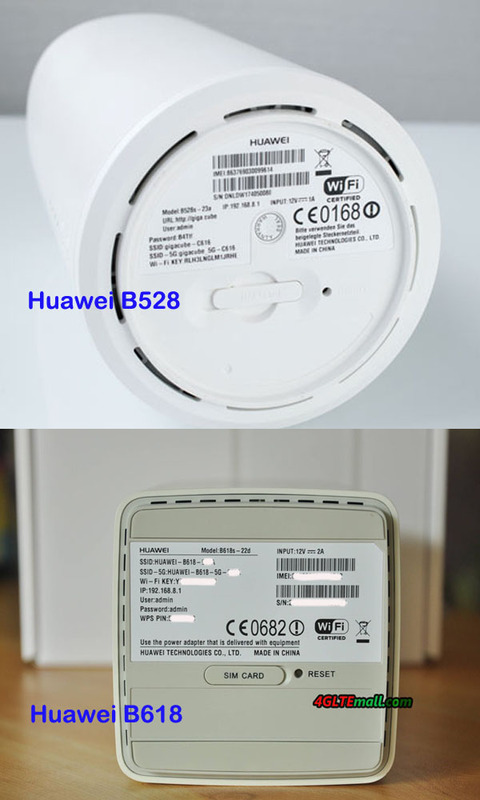 Since more and more Huawei LTE WiFi routers are available in the market, sometimes they had the similar name which may confuse the customer. 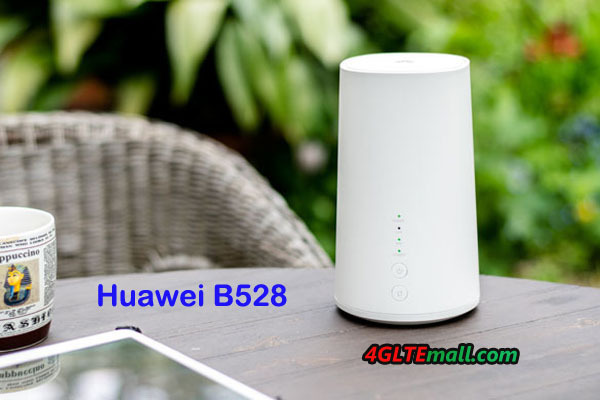 At the beginning of 2018, Huawei presented a new 4G modem router Huawei B612, following the Huawei B618 router. 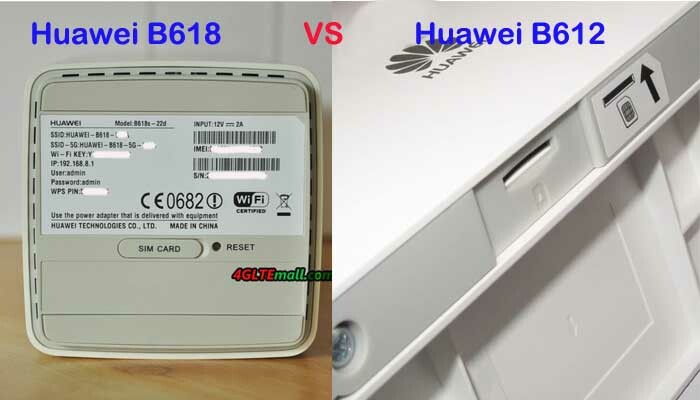 As you can see, the Huawei B612 and Huawei B618 router names are very similar. 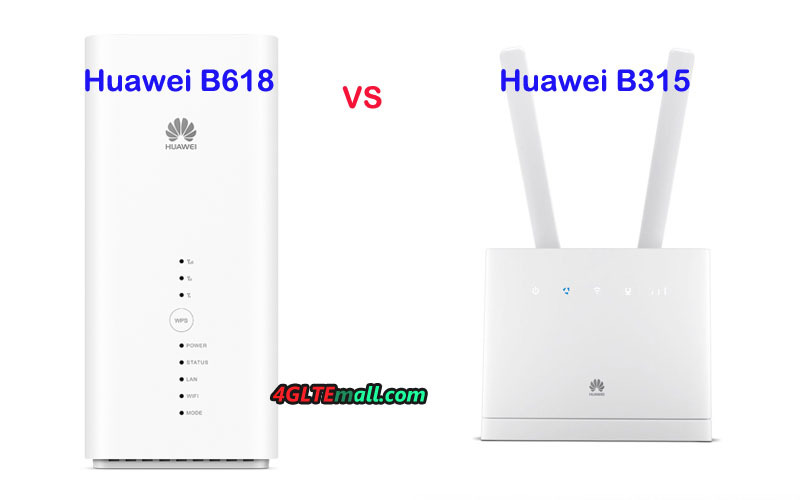 For those who are unfamiliar with Huawei routers, they may don’t know what the difference is between the Huawei B618 and B612 LTE router. If they want to buy one of the two routers, they may be in trouble to make the decision which one to buy. Today, we will compare the two routers specs and features so the customers may get some reference. Simply from the router name, it may not be easy to identify the two routers, but if you see them, it would be easy to recognize. The Huawei B612 4G LTE Modem is in a traditional router shape, on the front, there are indicators for Power, Mode, WiFi, LAN and Signal. On the back, there are 3 LAN ports and One port for both LAN & WAN. And there is also a telephone port with the Ethernet ports. 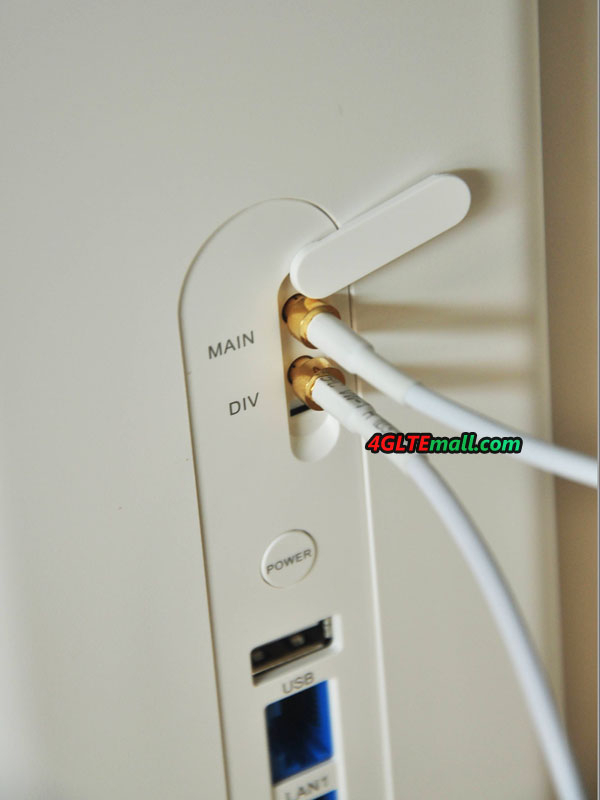 Like other Huawei 4G wireless routers, there are two SMA-male connectors at the back of the router and the connectors are covered by a long cap. The special design of the Huawei B612 router has an angled backrest for stand stability. 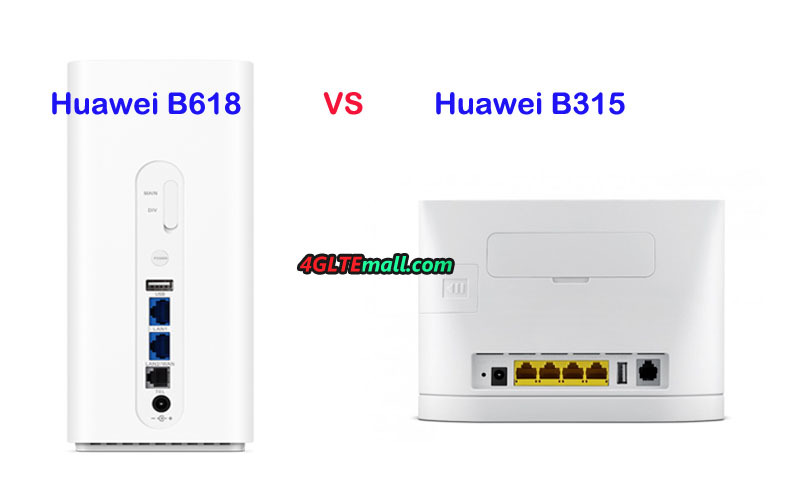 Huawei B618 LTE is not in a usual router design. It’s in a shape of cube, which looks cool like home furniture. 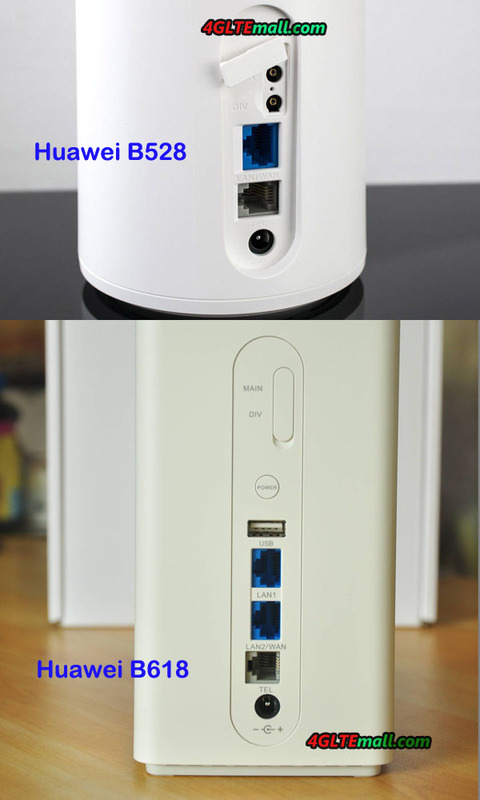 Like Huawei B612, Huawei B618 Cube is also in white color. On the front face, there are indicators for Power, Status, Lan, WiFi, Mode and Signal. The WPS button is in the middle of the indicators. 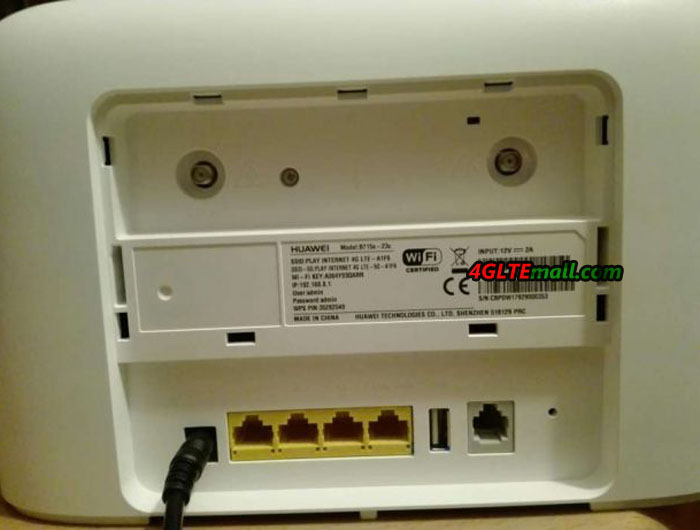 On the back of Huawei B618 WiFi router, there is One USB port, one LAN port, one telephone port and One WAN/LAN port. The power button is above the USB port. And there are also two connectors are for external antennas. The connectors are TS-9, not the common SMA connectors. The SIM card slot is at the bottom of the router. 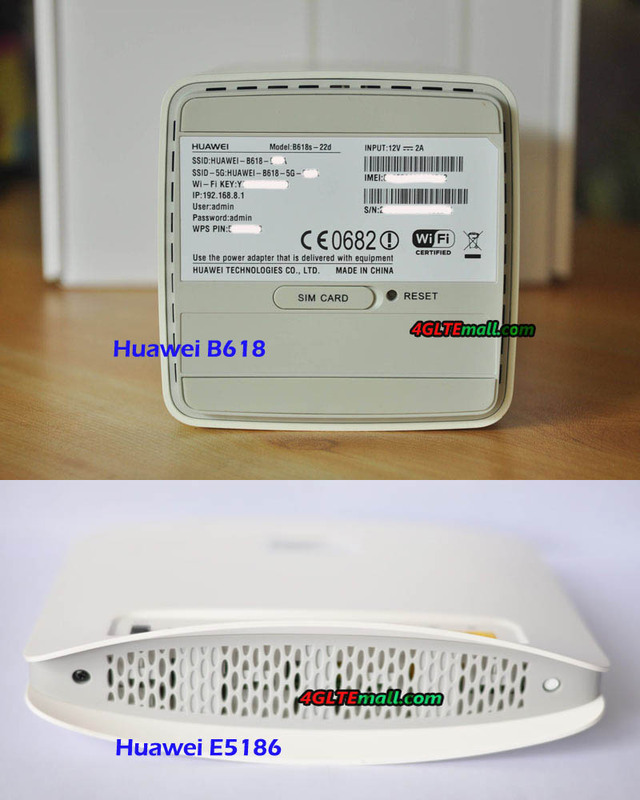 From the specs table, we can see the new Huawei B612 is just a 4G+ Cat6 router, the Huawei B618 LTE is with more advanced technology, which could achieve download speed up to 600mbps and upload speed to 100Mbps. The Huawei B612 could support only LTE Cat6 up to 300Mbps. They both have two variant models for difference LTE frequency bands. Huawei B618 seems to be more suitable for home use but Huawei B612s-25d supports LTE B42 and B43, which are usually for industrial applications. Huawei B618 supports up to 64 wireless users while Huawei B612 support only half to 32 users. But they both use 4 X 4 MIMO technologies. Of course, the more advanced Huawei B618 price is higher than Huawei B612 price. Considering the LTE frequency bands at your location and your network providers, and the price & interfaces, you can easily make the decision which one to buy now. More and more Huawei LTE advanced routers are available for many network providers in the market. Among them, Huawei B618 LTE router and B528 routers may be the most attractive models. They don’t have the appearance of common LTE routers, but they look cool in the cube shape in white color. 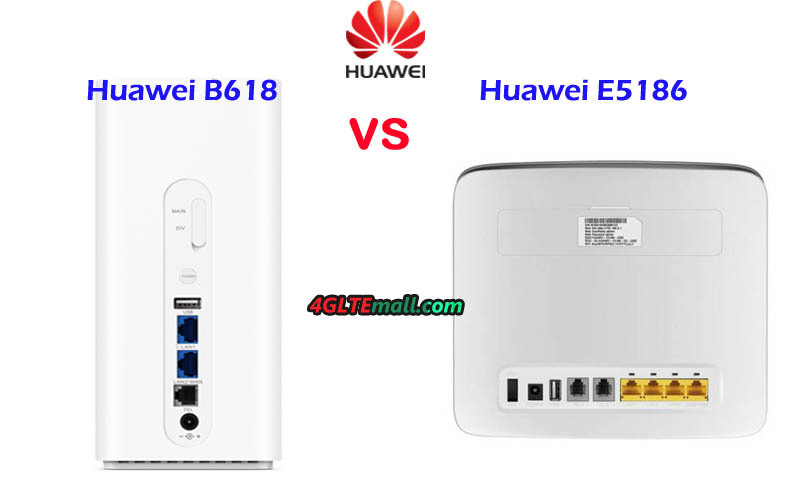 Somebody may ask, what’s the difference between Huawei B528 and B618 LTE-A router? Which one is better? If buying from one of them, which one to buy? After reading this article, we suppose you will find the answer. Huawei B618 and B528 LTE CPE are both available in 2017 and firstly presented the Europe market. The popular models for them are Huawei B618s-22d and Huawei B528s-23a. The Huawei B618s-22d LTE router is now available for Telekom in Europe. The Huawei B528s-23a was introduced by Vodafone to its product range. It’s also named Vodafone GigaCube or Vodafone B528s. Another network provider A1 also gets the B528s-23a CPE for its contract plan, and named it “A1 Net Cube Plus”. So the B528 may have Vodafone logo or A1 logo on the device. And the firmware may be customized by the network providers. The Huawei B618 is in square cube shape while Huawei B528 is in a cylinder cube. But they both look cool and the touch feel is good when handing them even though the body material is made of plastic. On the front of the Huawei B628s-22d, there are 8 indicators for the connection status and WPS button is in the indicators. Huawei B528s-23a has 4 indicators with the power button and WPS button. 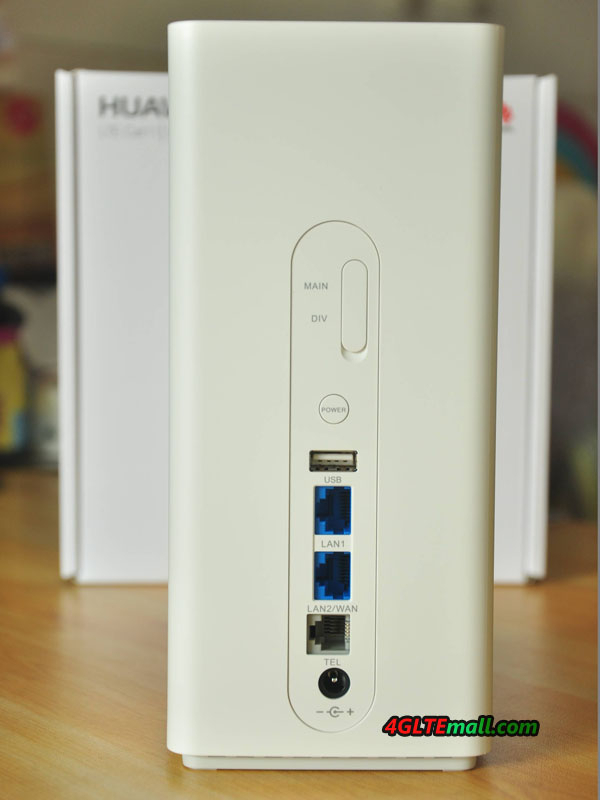 The power button of Huawei B618 is at the back with two gigabit LAN ports(one for LAN & WAN) and one USB port, above which, two connectors are covered a small cap. The Huawei B528s-23a has only one Gigabit LAN (RJ45) port and one VoIP port. 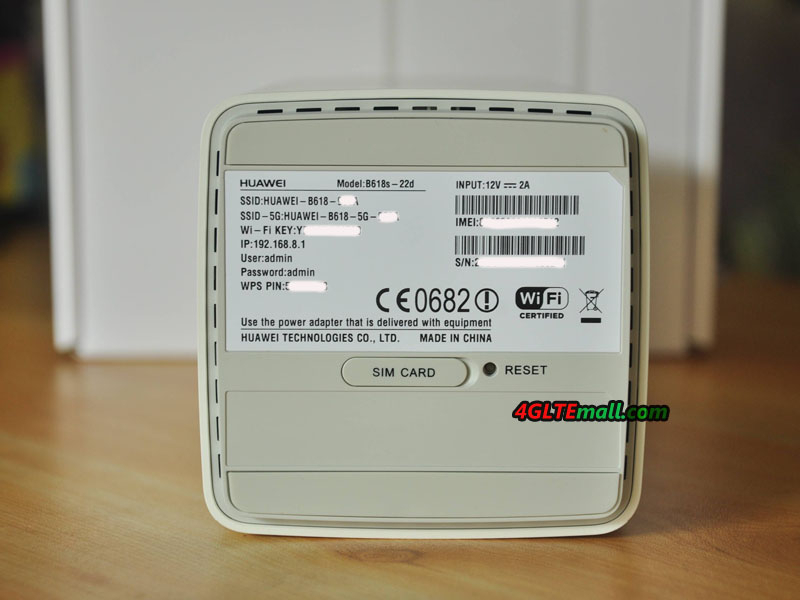 At the bottom of the Huawei B618 and B528, the SIM card slot is located with the device information label, where the product name, IMEI number, S/N number, SSID and WiFi key, certifications are listed. In addition, the reset button is also available at the side of the SIM card slot. 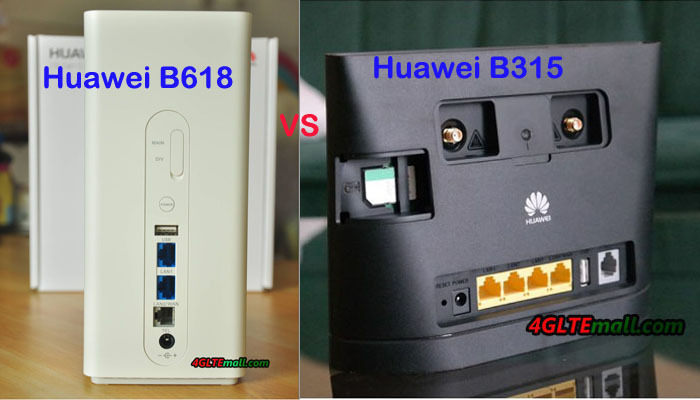 From the specs table, we can see that the Huawei B618s-22d is more advanced than Huawei B528s-23a. It could support faster download speed than that of B528 based on more LTE technologies. 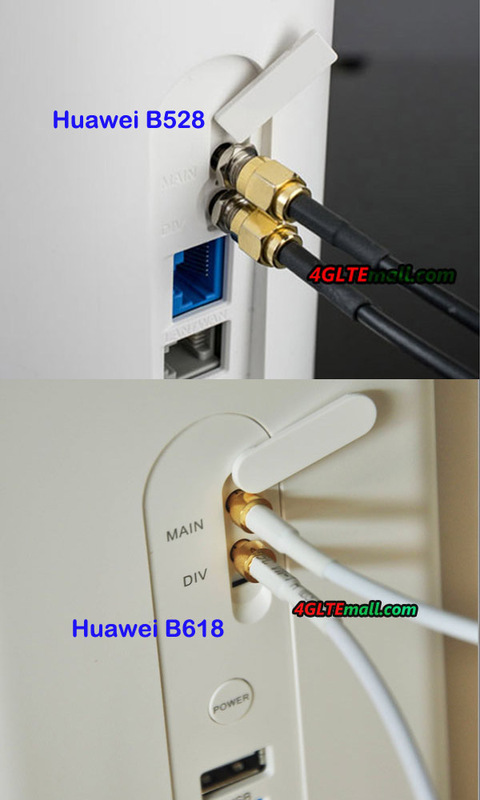 And more interfaces are available in Huawei B628s-22d for more connection possibility. Huawei B528s-23a has fewer interfaces and the speed is not as fast as Huawei B618, but for most users, the speed is still fantastic. And Huawei B528s-23a supports LTE band 32, which is not available in Huawei B618s-22d. Huawei B618s-22d LTE router has advanced features; consequently, the price of Huawei B618s-22d is higher than that of Huawei B528s-23a. So you are looking for an LTE advanced router with a budget price, Huawei B528s-23s seems more suitable for you. But if you need a future-proof router and would accept the high price, it’s no doubt that Huawei B618s-22d router is the best one for you. In the forest of 4G WiFi routers presented by the manufacturers, LTE routers sometimes are only available in certain countries. 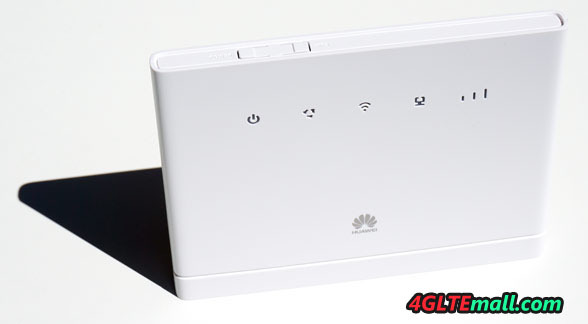 Now the new member Huawei B618 joins the family of 4G category 11 routers. As a reminder, category 11 (3GPP rel .12) allows a downstream peak rate of 600 Mbps and 50 Mbps upstream. LTE Category 11 specifies the aggregate of 3 carriers (256 QAM) in download for a single upload frequency. MIMO 2×2 and 4×4 support are possible. On the WiFi side, the WLAN module supports the 802.11ac standard with 2.4 GHz and 5 GHz frequencies for a maximum speed of 1300 Mbps (cumulative). The network compatibility makes Huawei B618s-22d would work well in almost all the countries in Europe, Asia and middle East, but as we mentioned at the beginning of this article, the Huawei B618s-22d is not marketed in some countries. 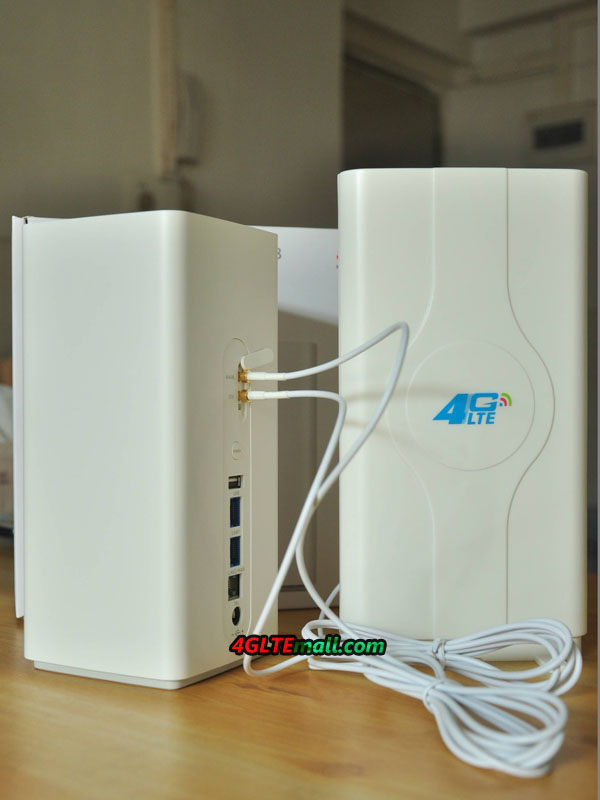 If you need this router, you may purchase from oversea online trader www.4gltemall.com. On the back side, we discover the power button, a WPS activation button. A USB 2.0 port is available for media sharing (under Samba). A Gigabit Ethernet LAN port allows wired distribution and a second port allows either Ethernet or WAN input. This WAN entry option implies the presence of a Failover mode in case of loss of either the WAN link or the 4G link. An RJ11 port is also available for connecting a phone or fax. The AC power connector is located at the bottom, because the B618 does not have an internal battery for a stand-alone mode. Finally, a hatch visible here above the power button conceals the 2 external 3G & 4G antenna connectors in TS-9 format. Under the device is the SIM card slot and the reset button. The Huawei B618 router supports 64 simultaneous WiFi connections (32 per band) via 2 internal non-removable antennas. The router offers VoLTE voice compatibility through its RJ11 port , which can be set in VoIP or CS mode (depending on the firmwares probably). It can also support IPv4 and IPv6, DHCP, DNS relay and NAT functions, and the basic protection functions are available (DDNS, deny ping ..). 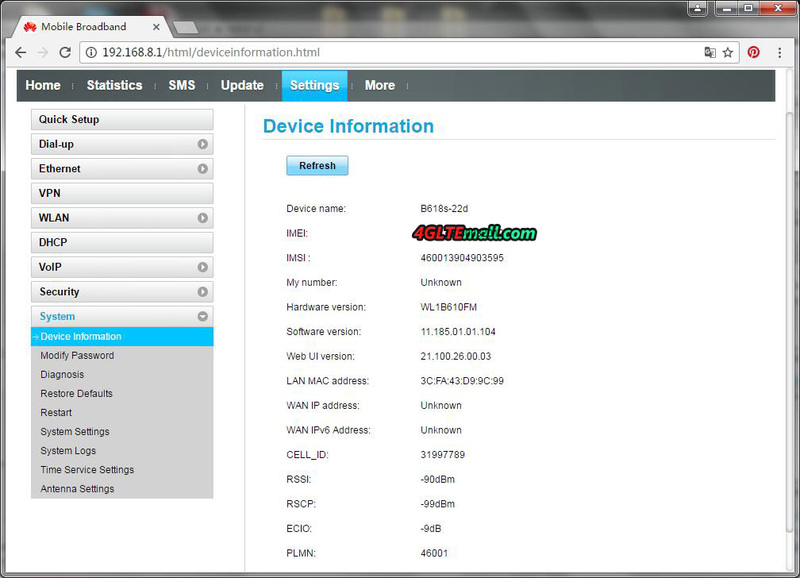 The firmware is very classic “Huawei” as shown on this page. And the Huawei B618 LTE CPE is compatible with the Hilink® smartphone app. The version Huawei B618s-22d is the one we are talking about here, however, there is another brother versions B618s-65d available on the market, this declination is intended mainly for the following frequencies: Band 1/3/5/7/8/28/40 (FDD 700/850/900/1800/2100/2600MHz & TDD 2300MHz). The 800 MHz is replaced by 700 (B28) and 850 MHz. 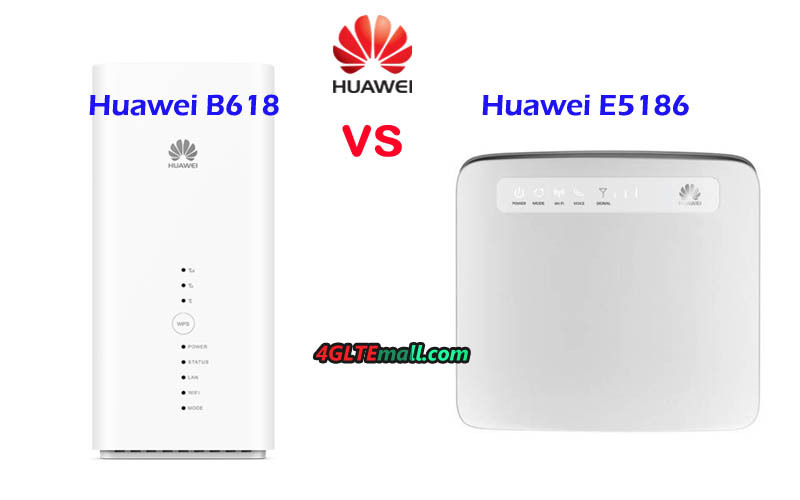 If you need the Huawei B618 router, just check your network provider deployed 4G LTE networks, if they just covers these bands, you could select Huawei B618s-22d or B618s-65d to get high-level LTE surfing with much faster speed. Huawei offers a new wireless LTE CPE B612 with powerful LTE modem recently. The B612 CPE supports LTE Advanced Cat6 with up to 300 MBit/s in the downlink and up to 50 MBit/s in the uplink, which is similar to the predecessor Huawei E5186 and B525 technically. 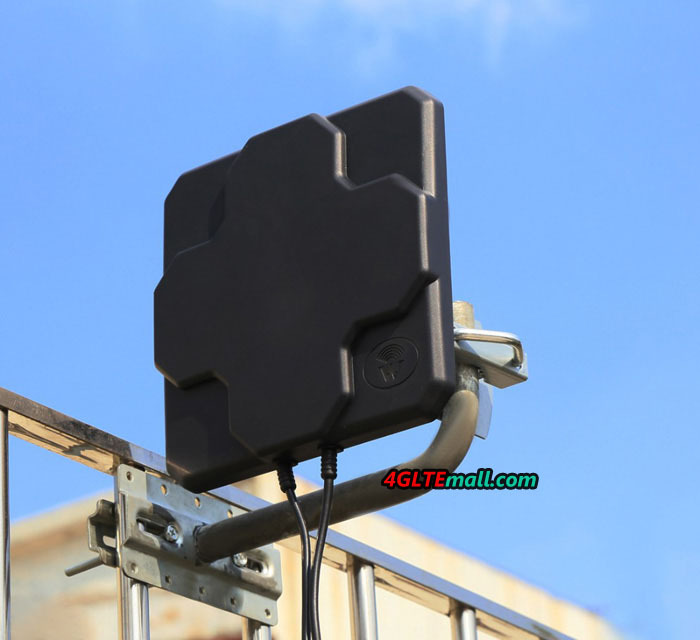 A special feature compared to the predecessor model is the support for 4 × 4 MIMO antenna technology. 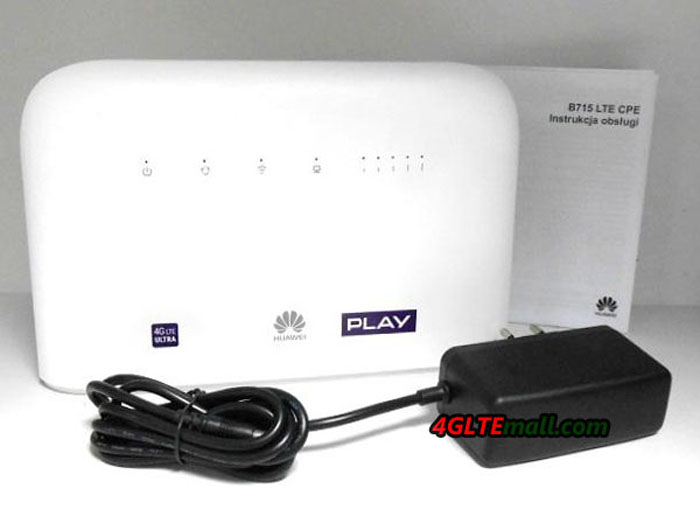 The router also offers a telephone function and connections for external LTE antennas, which are common specs for the Huawei LTE routers. Here now in some countries, the Huawei B612 LTE CPE is already available. 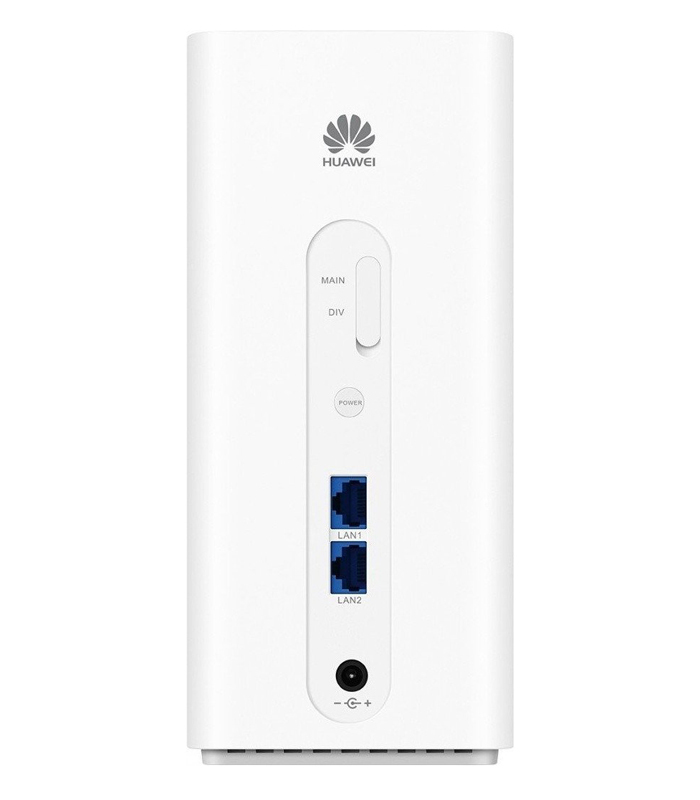 The Huawei B612 looks like a classic router, there is no special design or visual highlights. The case is held in matt white plastic. On the front several LEDs show the operating status, on the back you will find the connections. But where can you roughly classify the Huawei B612 compared to other Huawei LTE router models? 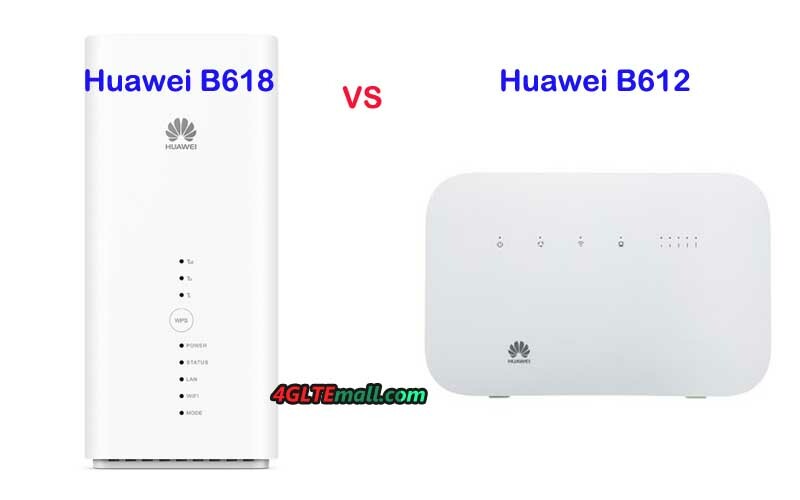 One thing is clear: the Huawei B618 with 600 MBit/s and 4 × 4 MIMO antenna technology has a much more powerful modem, but puts the focus much more on the body design and has fewer connections. The Huawei B715 LTE router can also use much higher speeds than the B612 at 450 MBit/s, but does not use 4 × 4 MIMO antenna technology. The B715 also has the most connections in the comparison with B612 and B618. The WLAN module of the Huawei B612 operates both in the frequency range around 2.4 GHz and 5 GHz and supports the 802.11ac standard. 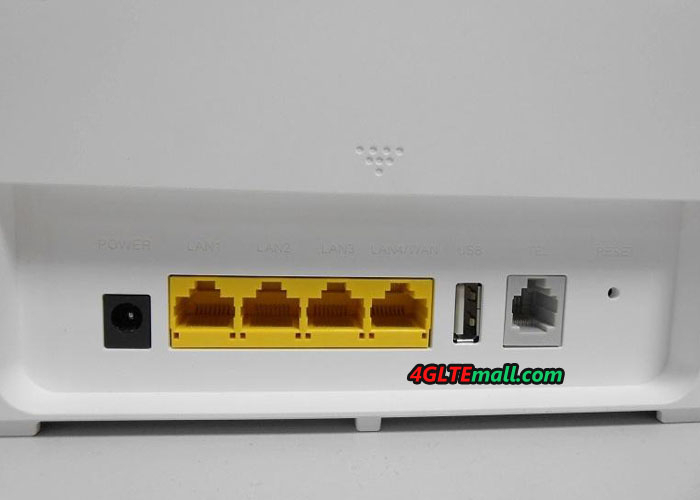 For connection to computer and game console, there are also four RJ45 Ethernet LAN ports on the back of the router. 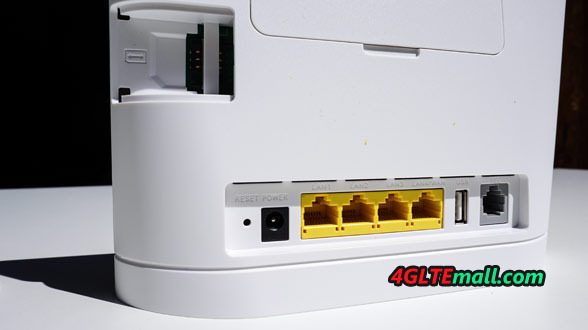 If you want, you can also use one of the four LAN ports as a WAN connection, ie an external modem can be connected there. The internal mobile modem is then disabled and you can use the router as a normal wireless access point. On the back you will find other connections besides the RJ45 LAN ports. On the one hand, there is the RJ11 connection for an analogue telephone, because the B612 supports telephone connections. On the other hand there are two SMA connections for an external LTE MIMO antenna, the connections are well protected under a cover. Here now the Huawei B612 is only available for few network provider in Poland and Chile, and the online retailers don’t have this new LTE CPE available. We suppose it would be available soon around the beginning of 2018, just like the predecessor huawei LTE router. We will take further test on this router once we get it. And we would also inform the availability if we have news from 4gltemall.com. The Telekom Speedbox LTE IV is visually certainly one of the most beautiful LTE routers that are currently available. The matt white cuboids also looks good on a dresser, unlike many other routers, the device does not need to hide. Various LEDs on the front indicate the operating status as well as the reception, a WPS button ensures fast WLAN connections without tedious password entry. The MicroSIM card is used on the underside of the Telekom Speedbox LTE IV; there is also a label with serial number and Wi-Fi password attached. The power supply, LAN cable and external antenna connectors are located on the back panel. In detail, we can find here 2x RJ45 Gigabit Ethernet and two TS-9 connections under a cover. But unlike the original Huawei B618s-22d router, there is no USB or an RJ11 telephone connection in the Speedbox LTE IV. And it doesn’t have built-in battery, which feature is available on another similar router Huawei B529s-23a. The Speedbox LTE IV must get external power supply and work. The web interface of the Telekom Speedbox LTE can be reached in the browser via the address 192.168.8.1. On initial startup, you are prompted to change the log in password to a custom one, eliminating unauthorized access and configuration changes. On the start page you get the most important information displayed clearly, including, for example, the amount of data consumed and the online time. Of course, the reception is also displayed, but you can also find it in any other menu at the top of a status bar. There are also tabs for “Statistics”, “SMS”, “Update” and “Settings”. Basically, the points are self-explanatory and quite clear, only in the settings, there are many sub-points, which are worth a close look. In the tab “Settings” you can specify, for example, whether the router should also go abroad (roaming) to the Internet and whether the network technology (2G, 3G, 4G) should be selected automatically or if you prefer to use only LTE, for example , The configuration of the WLAN interface can also be made here: up to 4 WLAN names (SSIDs), two each at 2.4 and 5 GHz, can be assigned, of course, each with an individual password. Some simple settings can also be made via the Huawei HiLink Smartphone App, which is available for Android and iOS in the respective App Store for download. If you just want to see the current data consumption quickly or want to read a text message, you will be fine with the app. For more detailed things, such as the choice of network technology, you still have to try the web interface, here comes the app to its limits. 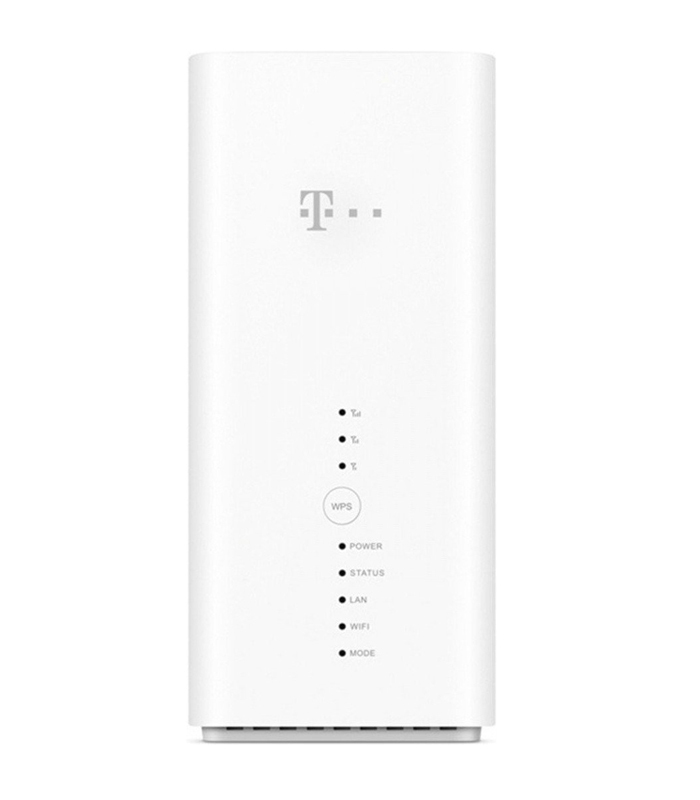 Overall, it should be noted: apart from a few technical details, the Telekom Speedbox LTE IV is a highly recommended and future-proof LTE router. For the price with contract, there is currently no information. Considering the functions deleted by Telekom, we suggest you buy original and unlocked Huawei B618s-22d to enjoy the full functions for the LTE advanced router. 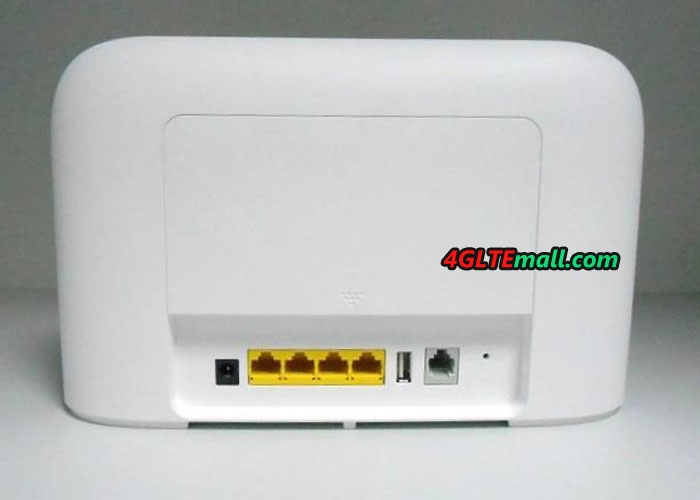 The Huawei B618s-22d unlocked router is now available www.4gltemall.com. You can get it without any contract and use it with almost all the network providers’ SIM cards in Europe. As a direct successor to the popular LTE Router Huawei E5186, Huawei presents a new LTE router B715 in Poland for the network provider “Play”. 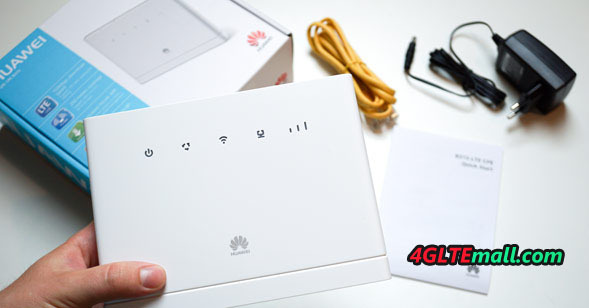 As a new LTE advanced router, the Huawei B715 reaches LTE category 9 with up to 450 Mbit/s in the downlink, which is a great improvement than the predecessor Huawei E5186 router. The B715 router has four RJ45 Gigabit LAN interfaces and a USB port, as well as an integrated telephone function with RJ11 connection. And we also see it’s available in Latvia for network carrier LMT with branded version. The Huawei B715 is currently only available in Europe. 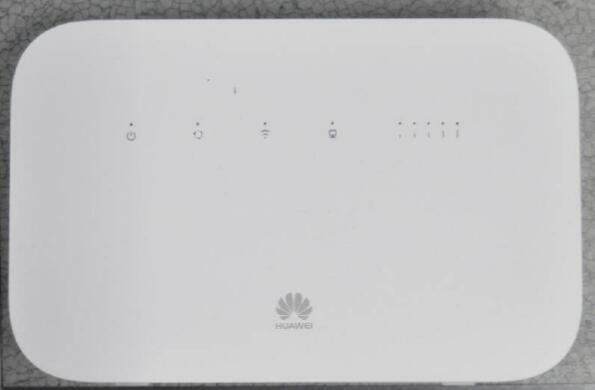 The exact model name for the new Huawei LTE Cat9 router is B715s-23c. This designation recognizes the modem optimized for the European market; in other parts of the world, the B715 CPE may have a slightly different designation and thus different equipment with support of different frequency bands. Since the frequency ranges used in Europe are mostly same, as well as in Austria and Switzerland, the B715s-23c can also be used without problems in other Europe countries. 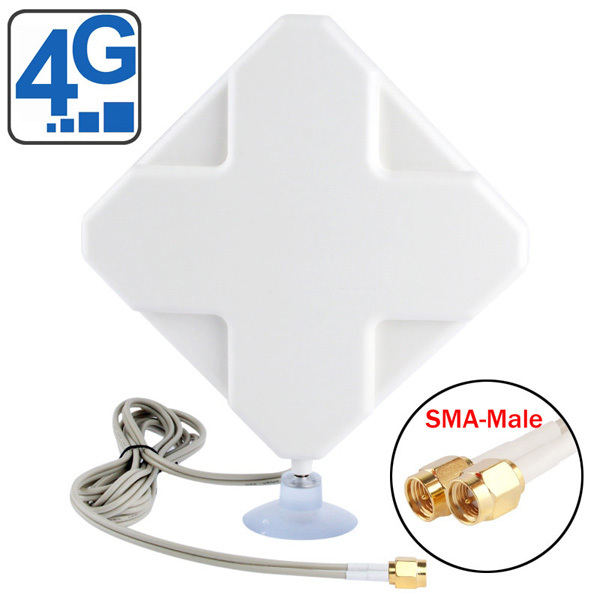 The Huawei B715 has integrated LTE antennas, but also has two SMA connectors on the back for an external LTE antenna, which can be connected when needed. The LTE modem can connect up to three frequency ranges by means of carrier aggregation (channel bundling), which theoretically allows up to 450 Mbit/s in the downlink. In the uplink, up to 50 Mbps are possible via LTE. In addition to LTE, UMTS (3G) and GSM (2G) are also supported. 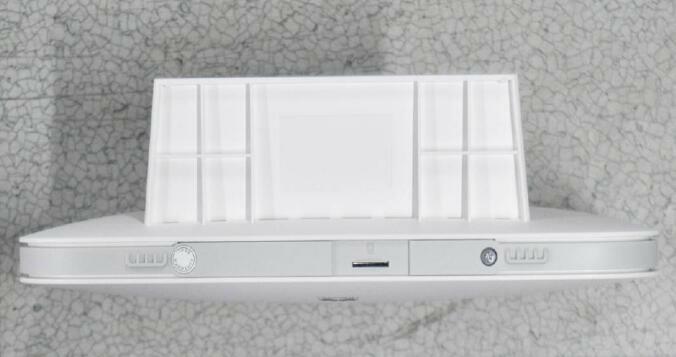 The RJ11 connector on the back panel of the Huawei B715 can be used to connect an analogue telephone, as well as a USB port for integrating a printer or storage media into the network. Wired devices can be connected via the four LAN ports. 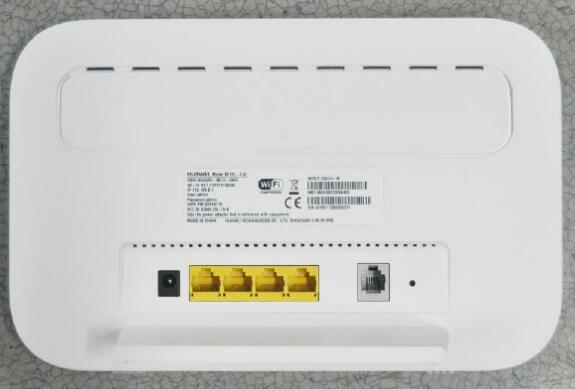 If required, one of the four LAN ports also acts as a WAN port, so the B715 can also be used with an external modem (eg fiber optic or cable modem). Wireless devices can connect to the Huawei B715s-23c via Wi-Fi, the router supports the frequency ranges around 2.4 GHz and 5 GHz. 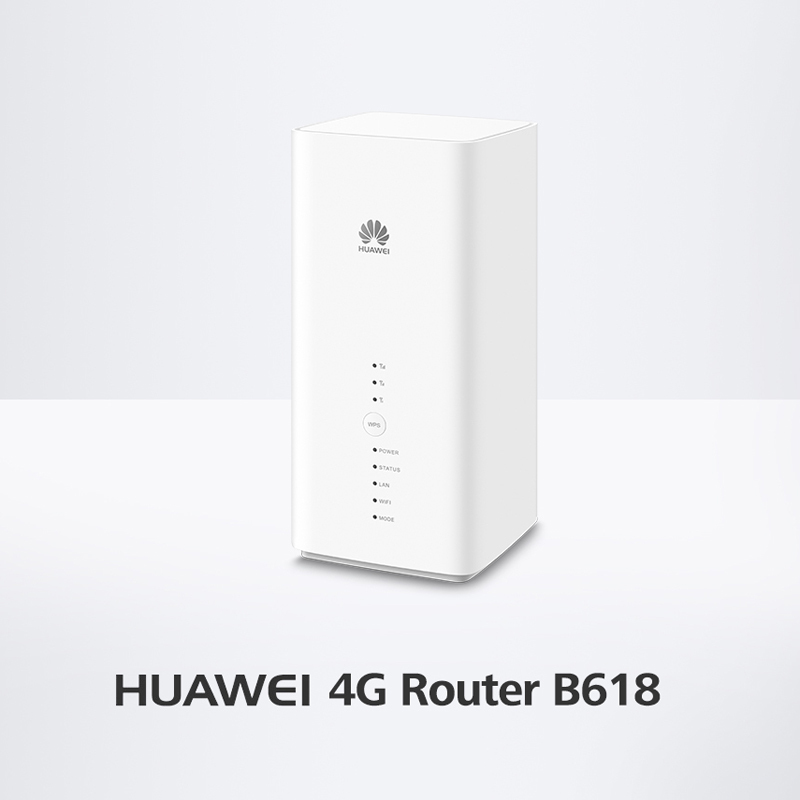 Attentive readers may already have noticed, with up to 450 Mbps, the new B715 LTE router is not the fastest router model in the Huawei product range. The Huawei B618 even offers up to 600 Mbps via LTE Cat11. The Huawei B618 also has the 4 × 4 MIMO antenna technology installed, the B715 can seem only on 2 × 2 MIMO antenna technology fall back. 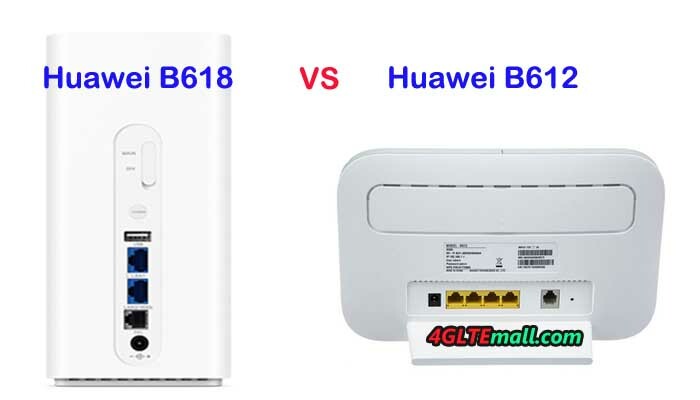 Nevertheless, the Huawei B715 also has advantages over the B618: there are four RJ45 Gigabit LAN ports and not like the B618 with only 2 TS-9 connectors, the B715 has the SMA ports for external antenna, which is common on Huawei LTE stationary routers. 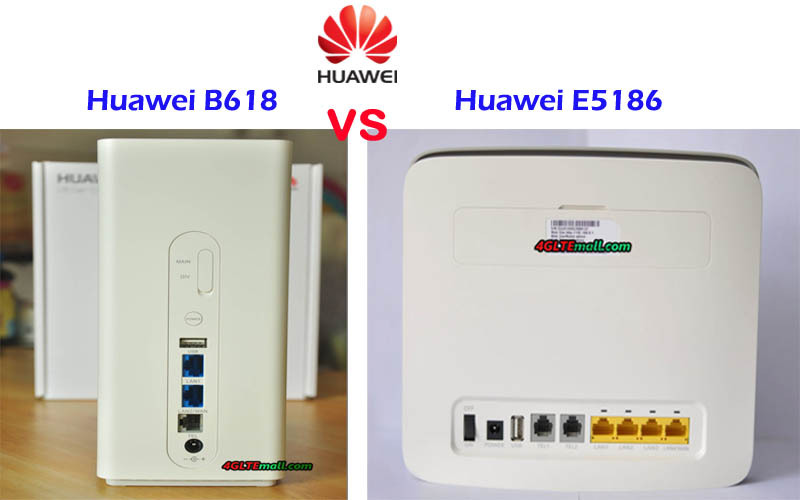 We would take full detail test for the new Huawei B715s-23c router, and compare it with the more advanced Huawei B618. Keep follow on us(twitter: 4GLTEMALL) and we will update our test report once it’s done. 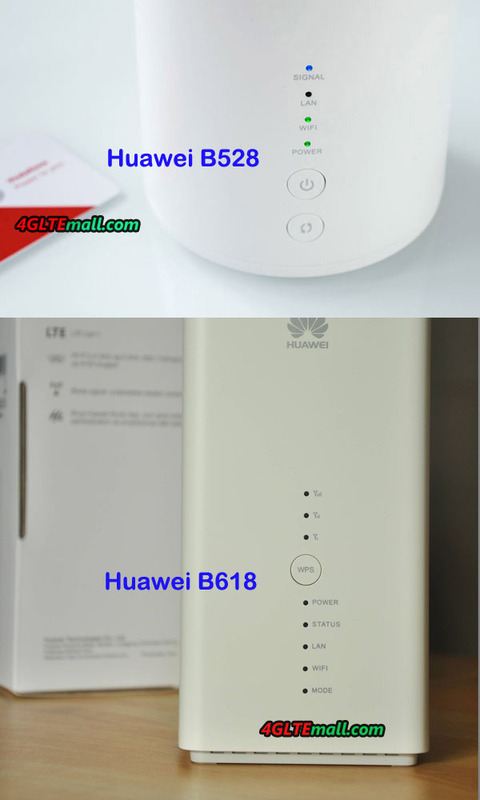 We had already reported about the Huawei B618 LTE router in February 2017, one of the first stationary routers with LTE Category 11 modem for up to 600 Mbit/s download. At that time, the device was available in Europe only from a single supplier in Poland, but now the availability has improved considerably. In Europe, the B618 LTE CPE is soon officially sold under the model number B618s-22d. 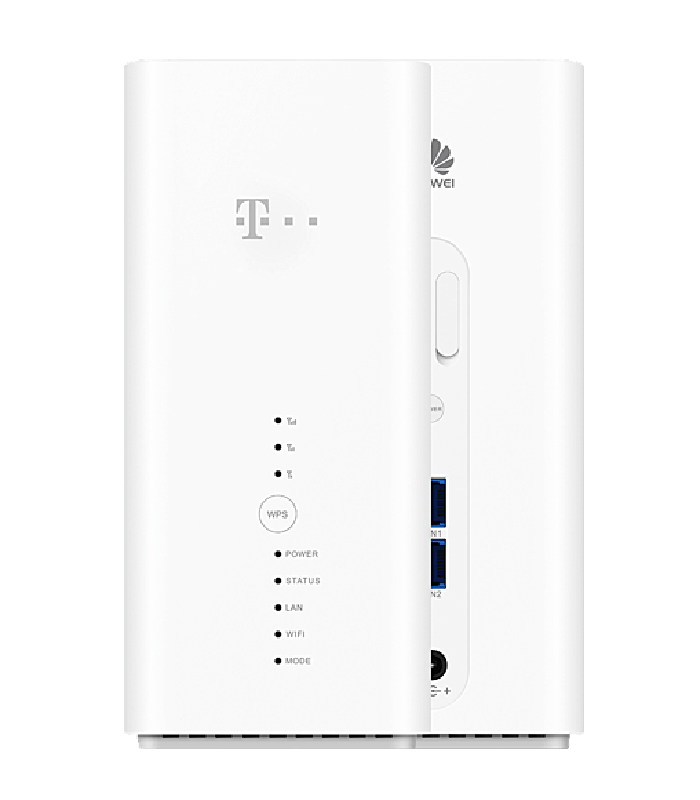 The network provider Telekom in Germany will also introduce the router as Speedbox LTE IV in its product range, but the telephone function of the original B618 will be missing, like its predecessor Huawei E5186s-22a router. The Huawei B618 offers very good technical equipment and a cube design in white high-gloss plastic body. On the front, there are various LEDs and a WPS button, on the back two RJ45 Gigabit LAN connections (one also as WAN usable), an RJ11 telephone connection and a connection for the power supply. There are also two TS-9 connectors for an external LTE antenna and a USB 2.0 connector. Inside the Huawei B618, there is a HiSilicon Balong 750 modem that supports LTE Category 11 (Cat11) with up to 600 Mbps downlink and up to 50 Mbps uplink. All key technologies for 4.5G LTE Advanced Pro can be found in the Huawei B618: 256QAM modulation, carrier aggregation and even 4 × 4 MIMO antenna technology there. Vodafone was the first provider in Germany to officially announce the use of 4 × 4 MIMO technology for LTE, so the Huawei B618 should ideally be suitable for the Vodafone LTE advanced Pro network. The WLAN module allows the connection to a maximum of 64 WLAN devices at the same time and works in both the 2.4 GHz band and the 5 GHz band. The Huawei B618s-22d is the European version of the B618 and the unlocked Huawei B618s-22d has been available on www.4gltemall.com since July 2017. You can use the unlocked B618 with almost all the network providers in Europe. Anyone who needs a high-level home router, the Huawei B618 is highly recommended due to the multiple practical functions. 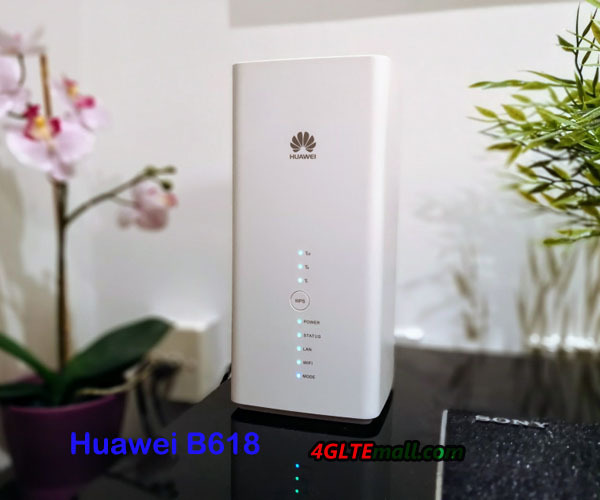 Since many network providers have not upgraded their network to LTE advanced Pro, the Huawei B618 may be too early to use and currently, the price for Huawei B618 is in high level, the Huawei E5186s-22a is still good to use on LTE cat.6 for download speed to 300mbps and upload speed to 50mbps. The most important is the price for Huawei E5186 is really budget now.